Padma ChaRUNty is the charity run event with the purpose of raising funds and fostering awareness for a charitable call in Bandung. It is a fun run with a 6 km distance. Padma Charunty 2019 merupakan charity run pertama yang diselenggarakan oleh Padma Hotel Bandung. Event amal ini adalah acara yang diadakan untuk penggalangan dana dan menumbuhkan kesadaran untuk panggilan amal di Bandung. Padma ChaRUNty 2019 comprises a 6-kilometer fun run with a purpose of raising funds and fostering awareness for Pondok Pesantren Hidayahtul Muna, Ciumbuleuit through sales of tickets. Pesantren Hidayahtul Muna is a local orphanage located at Jalan Bukit Raya, Ciumbuleuit with 140 kids leads by Mr. Zainul Abidin and established from 2014. The profit of the ticket sales will be donated to support the operational cost of the Pondok pesantren. 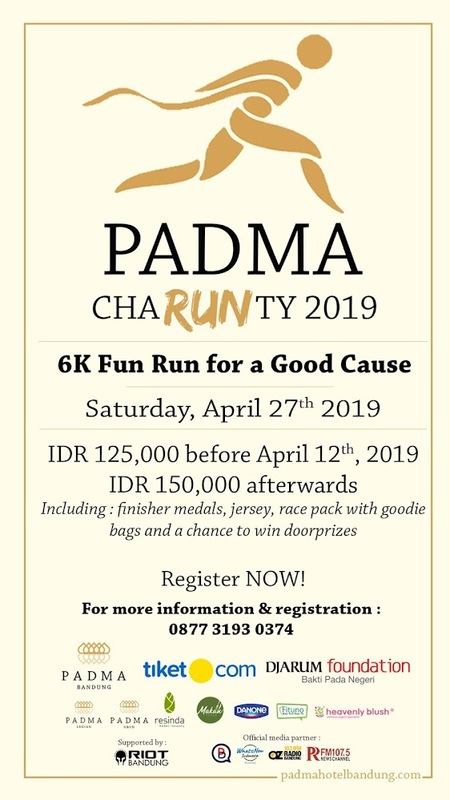 Join and register now for Padma ChaRUNty 2019, the first Padma Fun Run for a good cause at #PadmaHotelBandung and support the good cause by giving to local community. And get a chance to win door prizes from return flight tickets, staycation in Bali and a lot more! !